Notes One of the pathways involve driving through a well. Greenwood Village is an area in the Dragon Forest area of Timber Island in the game Diddy Kong Racing. 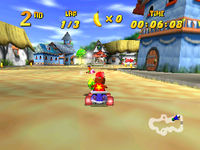 It is also featured in its Nintendo DS remake, Diddy Kong Racing DS. Seventeen Golden Balloons must be collected to access this track. The track contains a village square which requires precise driving to turn the corners. Many houses can be seen around the sides of the roads, and there are also many tunnels throughout the stage. Therefore, drivers with bad control might have trouble conquering the tracks many twists and turns. Some forks in the roads are also present in this course, but the different roads do not give the racers a major advantage. However, there is an opening in the village square one can use to skip a great deal of the beginning of the level. The track begins with a straight pathway into a tunnel. There are some Item Balloons in this tunnel, which can grant racers with offensive and defensive items. 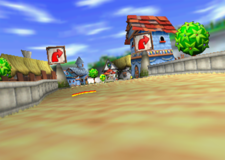 There is a turn in the track at the exit of the tunnel, leading into the center of the village plaza. A Zipper can be found on the way to the area. There is a good amount of space in the plaza, as well as a tunnel to the right. A well is also present in the center of the stage, along with another Zipper near the edge of the road. The racers must go into the tunnel through its entrance to progress through the track, where they can find Item Balloons. The well in the plaza can also be entered to get in this tunnel, and it provides a small shortcut. There is a small hill at the end of the tunnel. Once players drive to its top, they can find the outside of the tunnel in a large forest, filled with many large trees and branches. The road here is rather bumpy, so they have to be careful when driving. Another tunnel can be found at the end of this road. The tunnel as a few turns in it, as well as a Zipper as its exit. Racers can take the Zipper for an extra speed boost. Outside of the tunnel is a fork in the road. The route to the right takes players over a wide pathway and then into the next tunnel, while the route to the left takes them through a narrow tunnel. This tunnel eventually meets up with the tunnel found in the route to the right, where player have to make a sharp turn to get back onto the main path. The outside of the tunnel is not to far from this point. After passing a green Item Balloon, the way out can be found. There is a sharp turn at the exit, followed by another one right after. A Zipper can be found on the second turn to give the racers another speed boost. After the Zipper is a long road, leading around the bend and going to the final Zipper. This Zipper, located just above some water on the bridge, can boost players forward into the finish line. Like the other levels of Diddy Kong Racing and Diddy Kong Racing DS, Greenwood Village is filled with eight Silver Coins, scattered all around the area. However, the coins only appear once the player has beaten the world's boss at least once. Many of the coins in Greenwood Village appear in hard to reach places and hidden areas, adding difficulty to the challenge. The first coin is located in the plaza. If a sharp turn is taken to the left of its entrance, the coin can be found. Another coin is located just before the first tunnel. It is on the right side of the road. Inside of the tunnel, player should make a sharp turn at the first curve to find the third coin. In the forest area outside of the first tunnel, another Silver Coin can be seen near the edge of the road. Near the entrance to the second tunnel, the next coin can be found. At the fork in the road outside of the second tunnel, players should take the route to the left to find the coin in another tunnel. At the same fork in the road, racers should take the route to the right to find the Silver Coin on the edge of the road. Outside of the final tunnel, players can find the last coin on the first turn. A very sharp turn is recommended when grabbing it. In Jet Force Gemini for the Nintendo 64, the track is copied and used as an unlockable multiplayer feature. The track can also be accessed in the Nintendo 64 version of Mickey's Speedway USA by way of GameShark codes. It is not known if the track was used for testing or if it's simply a leftover. This page was last edited on December 19, 2018, at 18:01.